This documentary, filmed by Erin Spokes and Julie van Loben, tells the amazing story of how the Refugio de Esperanza was founded and how it has grown to serve thousands of children and youth with disabilities in Peru over the last 25 years. Refugio de Esperanza was founded in Pucallpa, Peru, in 1987 by Pastor Victor Manuel Izquiero Lora, together with his wife, Ana Mendoza Lopez. This Amazon region of Peru was, until recently, one of the remaining pockets of the polio virus, resulting in a population marked by the paralysis it causes. The area is also rife with other disabilities brought on by malnutrition, accidents, snakebites, lack of medical care, and general poverty, with the sobering statistic that one in four individuals has some sort of physical, mental, or learning disability. Because Pastor Victor survived polio, he understood the unique needs of people with disabilities. He was inspired to create a place for individuals like himself to personally develop, to learn a profession, and to know the love of God. 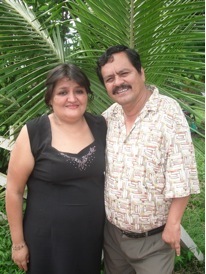 Pastor Victor and his wife Ana, shown in the photo below, describe their early beginnings. We started quite humbly, myself, my wife Ana and six of our friends who were also affected by polio and shared a common vision for helping others. We had no money, but we believed in God. We lived in tents and grew corn and yucca. We had no water, no bathroom and no lights. Each year, I went by foot, by boat and by car through river towns and villages looking for young people with disabilities who wanted to work and to learn. The first year we had six students. Little by little we grew and grew until now we serve hundreds. Our goal was for each student to become economically active and independent. We wanted them to learn a trade, to work, to earn their own money, to buy their own food, and to not be dependent upon others. Initially, we taught shoe repair, sewing, electronics and sign making. We grew until we realized that we needed a program for children too young for vocational training. So, we created an elementary school. At first, the elementary school was only for children with disabilities. However, soon their siblings and friends also wanted to attend, so we opened the school for all children to learn together. This integration of children with diverse abilities has created a special community. Founding the non-profit “The Refuge of Hope” in the U.S. The school in Peru is now supported in the U.S. by the establishment of an American 501(c)3 non-profit organization by Maureen Estevez who went to Peru in 2008 and was impacted by the love, care, and enormous sacrifice of the leaders and staff there. This non-profit org, “The Refuge of Hope”, began in 2009 and is run entirely by volunteers so that 100% of donations go directly to support the children by providing food, electricity, running water, books, and school supplies, as well as to start-up sustainable tree farming and hen raising projects.